France is favored to progress to the final against a Serbian side sorely missing injured former world No. 1 Novak Djokovic, Viktor Troicki and Janko Tipsarevic. France's Lucas Pouille takes part in a training session in Lille on September 14, 2017, on the eve of their Davis Cup semifinal against Serbia. Yannick Noah's France takes on star-starved Serbia and 28-time champion Australia faces Belgium in the Davis Cup semifinals this weekend. 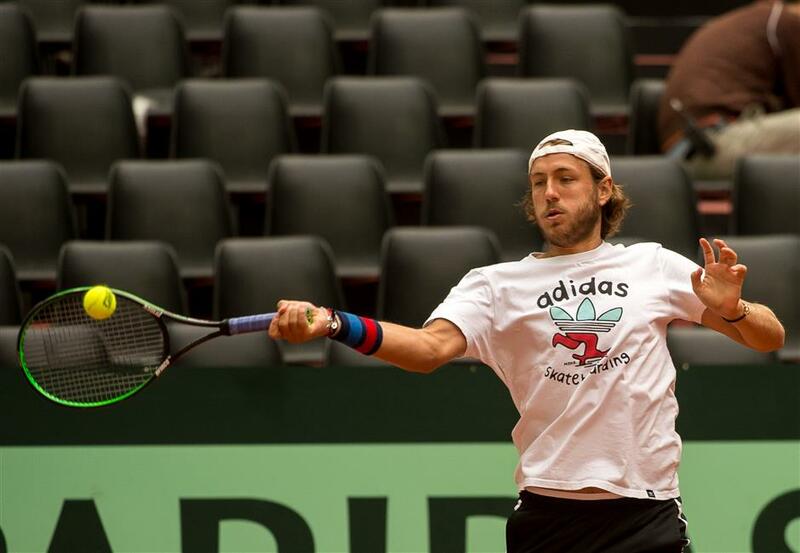 Lucas Pouille leads hosts France into battle in Lille against Dusan Lajovic in Friday's opening singles. That's followed by French No. 1 Jo-Wilfried Tsonga crossing swords with Davis Cup debutante Laslo Djere, the highest-rated Serbian at No. 80 in the world. Noah's team is favored to progress to the final against a Serbian side sorely missing injured former world No. 1 and 12-time Grand Slam winner Novak Djokovic, Viktor Troicki and Janko Tipsarevic. But Pouille insisted despite its rankings superiority the semifinal was no foregone conclusion for France. "We are not over-confident, we've got an enormous amount of respect for this team (Serbia) which has a lot of very good players," said Pouille, who was beaten in the fourth round at the US Open. A similar note of caution was sounded by Noah ahead of the tie being held on the same clay where France lost the 2014 final to Roger Federer's Switzerland. "We are sufficiently intelligent to know that it's going to be a difficult match," the 1983 French Open winner said. "Even if their players aren't at the top of the rankings they've got nothing to lose. We won't be playing an exhibition match this weekend." Serbia won its sole Davis Cup title in 2010, beating France 3-2 in Belgrade. France, which secured its ticket to the semifinals after seeing off Great Britain 4-1 in the last eight, is seeking a 10th title but first in 16 years. In Brussels, Belgium's David Goffin will be out to embellish his phenomenal record in the competition against 185th-ranked John Millman. Goffin, ranked No. 12 in the world, has won 13 of his 14 Davis Cup matches, the lone loss coming in the 2015 final to Britain's Andy Murray. Belgium's medical team has been working round the clock to ensure Goffin's presence after the star player injured his left knee at the US Open. Goffin, the ninth seed in New York, was stunned by Russian teenager Andrey Rublev in the fourth round. Next up on the indoor claycourt in the Belgian capital Australia's gifted but combustible Nick Kyrgios (No. 20) faces 33-year-old Steve Darcis (77). Kyrgios, who helped Australia beat the United States in the quarters, was picked by Australia captain Lleyton Hewitt despite his first-round exit at Flushing Meadows. The victorious semifinalists will meet in the 2017 final scheduled for the end of November.